These beloved Indonesian chips are actually flattened, fried seeds. Fried emping ready to nosh. 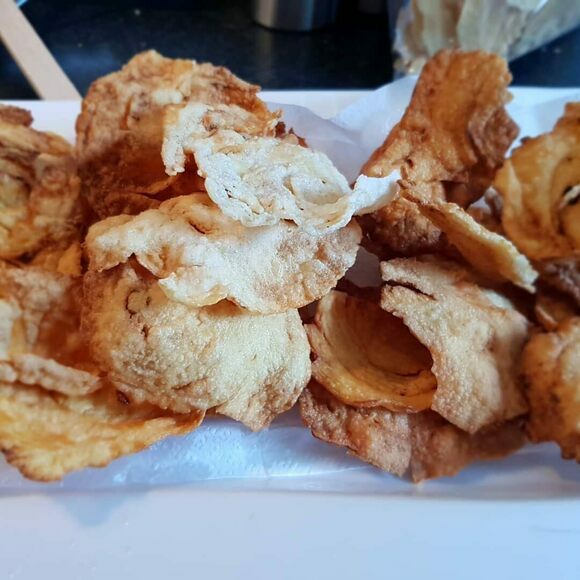 The crispy, fried snack chips known as emping often win over visitors to Indonesia. On a trip to Jakarta in 2010, former U.S. president Barack Obama declared them enak (“delicious”). Every batch of these savory snacks begins as a humble cluster of fruit hanging from the melinjo tree. Looking a little like a miniaturized mango, the fruit’s juicy appearance belies the slightly bitter seeds inside. But a little heat and a lot of handiwork transforms these nutty-looking seeds into Javanese gems.